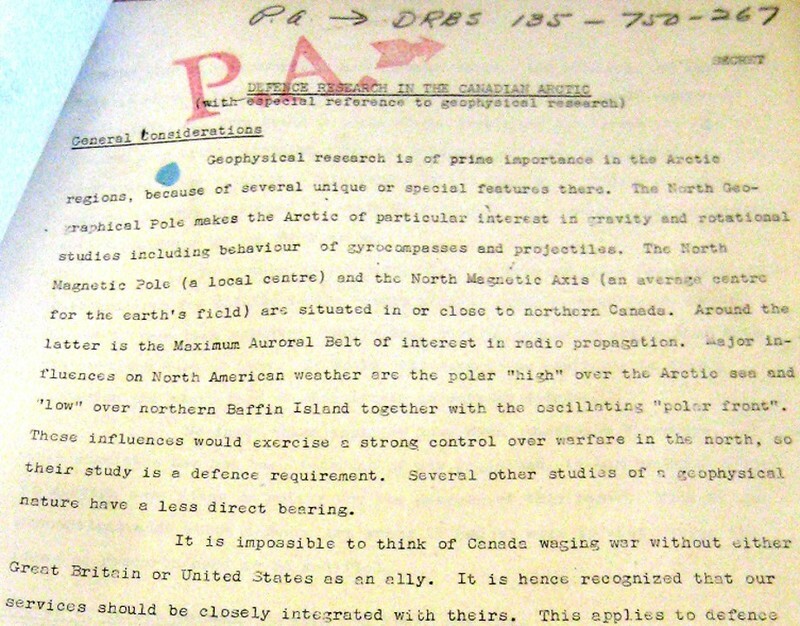 A document is pictured that looks like a government memo titled "Defence Research in the Canadian Arctic" with the indication "SECRET" in the top left. The first subheading is labelled "General Considerations" and discusses the reasons behind conducting defence research in northern Canada which are mainly to do with the effect of the Earth's axis and magnetic field on gyrocompasses and projectiles. The document has a red stamp at the top that has the letters PA and a large red arrow, there is also scribbled writing at the top with a PA and an arrow pointing to more writing "DRBS" and a string of numbers. ,” Exploring Greenland, accessed April 19, 2019, http://exploringgreenland.org/items/show/14.